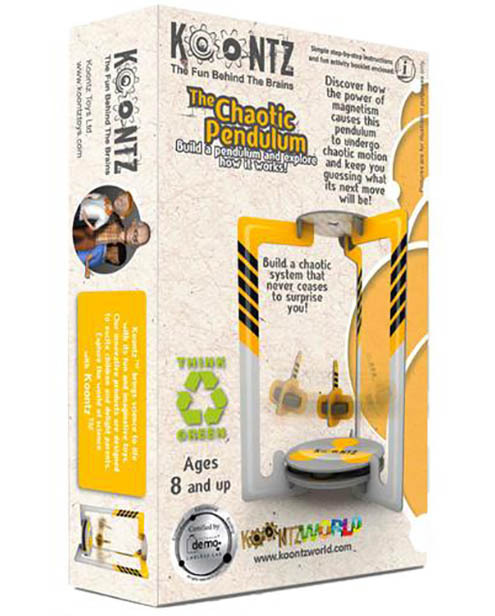 Build a pendulum from strong, easy-to-assemble, precut durable and recyclable cardboard parts, string and magnets. Bring science to life with fun and imaginative toys from Koontz. Explore the science of magnetic force and learn how its power can be used to keep the pendulum moving in a chaotic system. Can you guess what its next move will be? Instruction leaflet explains the history of the pendulum and its use and suggests further ideas for fun play. Dimensions: 14 cm (w) x 36cm (h) x 3 cm (d). Suitable for all scientists aged 8 and over.